For many fermentation recipes, especially those using grains and vegetables, salt is a critical ingredient. Salt, when used in the right proportions, creates an environment within which we are able to better control the growth of microorganisms and have a happier ferment. Some fermentations such as yoghurt and other beverages which don’t use salt require a strenuously sterile environment if everything is to come out well. While the first defense is always cleanliness (I always scrub my hands thoroughly, wash the fermenting vessel well and clean my work surface prior to getting to work), salt gives a fermentation project extra level of protection, creating an environment where harmful microorganisms have a difficult time thriving while not hindering the growth of the bacteria and or yeast which is beneficial to the fermentation and your health. How much salt do I use and how do I use it when I am fermenting? Dry salting – tossing your vegetables with salt and allowing the salt to draw liquid from the vegetables. For this, the typical amount of salt to be used would be approximately 1 TBS for every 1 1/2 lbs of vegetables. You can experiment with using less as I do sometimes. The salt effectively stabilizes the environment while the bacteria involved in the fermentation take hold, somless salt means a little more risk of spoilage. This technique is commonly used for sauerkraut. Pre-brining – mixing a brine by dissolving salt in water and then soaking the vegetables in the brine. This is followed by draining off the brine and then compressing the vegetables to encourage further liquid to escape the vegetables and cover the vegetables for the fermenting process. A stronger brine of 4 TBS salt for 4 cups of water is good for this. I use this commony for kimchi. Bouyancy Brining – that’s my term, but basically it’s a very strong brine (something that if you swam in it, you’d have a hard time not being bouyant). This can work well when you need to pickle and preserve something without needing to refrigerate it afterwards, as in making actual pickles. Once pickled and when ready to eat, you can rinse the vegetables several times to remove some of the salt so as to make the dish/pickle more palatable. Added Salt – sometimes, when fermenting salsa or something that is more akin to a paste (mustard, horseradish, ketchup, etc.) I’ll simply add some salt to the mixture to help keep the environment more stable. Please note regarding the use of kosher salt – when measurements in Tablespoons are used in this article, that the salt used is a normal grained sea salt or table salt. 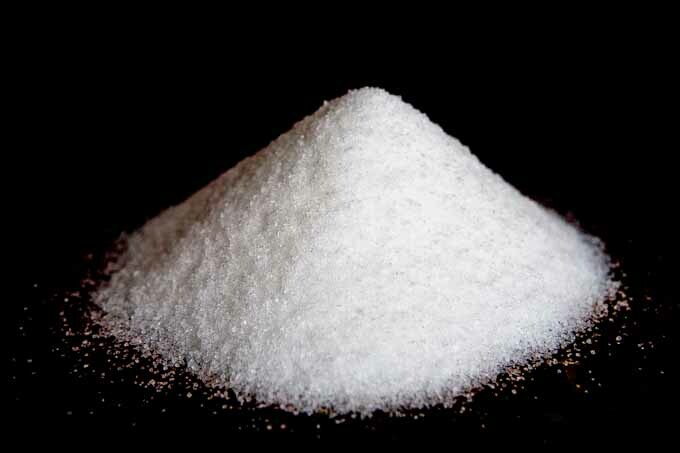 For courser grained salts such as kosher salt, there is less salt by volume since there is more room for air between the grains. This of course depends on the size of the grain, but a good rule of thumb is that if you are using kosher salt, use 25% more by volume. How much salt should I use for a brine? i have a scale in my kitchen which I would recommend to you which comes in quite handy for measuring salt proportion by weight. This scale has a “Baker’s math” function. You simply weigh your water and press the % key. Remove the water and then place salt on the scale and it will display as a % of the original water weight. Keep adding salt until you get to the targeted percentage. Which type of salt should I use for fermenting? I recommend using sea salt where possible as it is a naturally formed salt and often contains various nutrients including trace amounts of magnesium, potassium, and calcium. 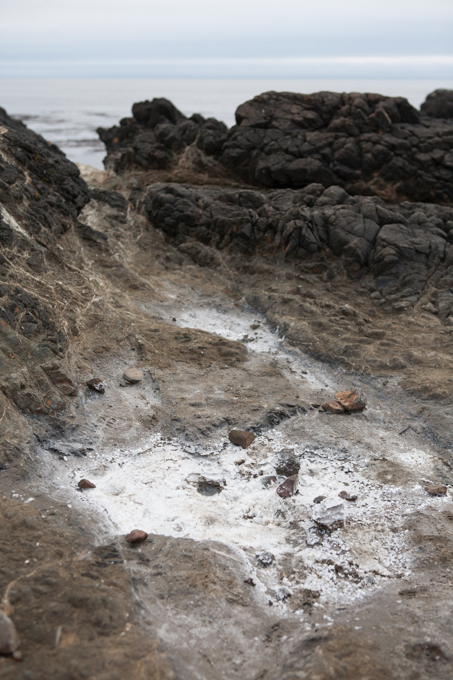 Living on the California coast, I sometimes go out and collect some of my own sea salt off the rocks – (see image to right and large image above). Some of the best salts for mineral values are Himalayan sea salt (still boggles me how the Himalayas can have sea salt, but that’s another topic entirely) and the sea salts found on Islands off the Atlantic coast of France. Pickling salt is fine as well as is kosher salt. I don’t recommend using standard iodized table salt as it contains iodine which can have a negative effect on the bacteria that ferment the food. Also, as part of it’s processing, it is stripped of its trace mineral content and is diluted with an anti-caking agent. Please feel free to share any additional thoughts or information here. Happy fermenting! Hi, I don’t have access to sea salt…However plenty of natural black rock salt available…Will that work for fermenting? Thanks Viviek for your question. I haven’t tried fermenting with black rock salt, but I imagine it would work fine. My understanding is that it has a little less sodium than other salts so perhaps a little extra might help. It can have a bit of a sulfuric smell to it, so that will simply be a choice for you to make. Might be a nice flavour enhancement in the Shivakraut, Indian Spiced Cauliflower or Dosa recipes. If you try it, please let us know how it goes. Heather, Try a less concentrated brine. Personally, I use 3% for just about everything. Great page! I’m very much look forward to future emails from you. Is there a quantity error above? 960 grams of salt per 4 cups of water? Sorry if that wasn’t clear. I was simply showing how I calculated the math. 4 cups of water weighs 960 grams. Hi Ted. I was just wondering if you’ve ever tried using sterilized seawater as a brine. I keep buying salt and purified water (our tap water has chloramine) but I live on an island. I think seawater salinity level are around 3.5 percent, so it should work, right? Hi Cassie. Great idea! Sterilized seawater should work fine for a brine. Depending on where you are, it may add a subtle flavor as well. You are right, the salt weight in sea water is in the 3.5% range which should be a sweet spot for some brining recipes. I’ll give that a try later this year just to have my own experience of it, but I’m sure it’s fine. Good luck! Thank you for this info, very useful. I wanted to verify what you said about Bouyancy Brining – so basically after it’s done, I can remove the excess salt from say fermented cabbage by washing it in water and I still don’t have to put in the fridge? How long can I keep it outside? Hi Eli, I don’t do “bouyancy” brining except sometimes with pickles. As to refrigerating, that simply slows down the fermentation process. If you’ll discarded all liquid, then effectively you are opening your ferment up to mold spores and thus you’ll want to jar it up and refrigerate it for sure. Hi Ted, I’m just about to start fermenting for the very first time. I have just taken delivery of 2 x 10 litre Gartopf crockpots. I would like to start with a traditional sauerkraut and a red cabbage one. Roughly how much cabbage do I need to fill each one? I am a vegan and I have seen some recipes calling for whey or vegetable broth. Are there any vegetables I won’t be able to ferment without adding whey. We grow a lot of our own organic veg and by October/November we will have a lot of pumpkin. Can that be fermented using just salt? We started making Kombucha a few weeks ago which is delicious so we are very excited about fermenting the veg. Sorry, I’m not sure how much cababge to use to fill your container. I’d start with a smaller batch, maybe with 3-4 lbs (1.5-2kg) of cababge for your first attempt and then calibrate from there to see what works in your new crocks. Sounds like you are gearing up for a great fermenting future! good luck and keep us posted on how things go. As to whey, I have never found the need to use whey. I’m a firm believer in the power of the bacteria which is naturally found on the specific vegetables you are fermenting. I have made several of your recipes with an airlock and they have turned out brilliantly! The only problem is that I have been on a low-sodium diet for a long time and now anything with any salt tastes too salty. What is the lowest salinity for your ferments that will insure safety, or should I switch to using whey for my concoctions? I’m not certain of the answer to your question. In general, the less salt, the less stable the fermentation and the more likely you’ll run into potential problems. If you use less salt, definitely err on the side of greater cleanliness during your preparation process. I’d suggest simply experimenting with less salt and seeing how it goes. Let us know please! Is there danger of ingesting too much salt when eating salt-fermented vegetables ? Help, Help the last two patches of fermented dill pickles have had mush cucumbers. The first batch I did were crunchy and pleasant. I used the same amount of salt for both. Both had jalapenos, onions, and carrots in with the cucumbers. I used cabbage leaf on both batches. The first batch I did not use bay, oak or any leaves to add tannin. The really mushy batch had an oak leaf. Anyone know where I can look for a problem area? Cut off the blossom end of the cucumbers. There’s an enzyme in it that can cause the cucumber to become mushy. Hi, Ted – First, thanks for writing this up. I have one small quibble, though: All salts have a different weight for a given volume, so standard measurements like 2 Tbl. per quart is not entirely useful. Kosher salt weighs about half of what standard salt — like sea salt — weighs, so you would need something like 4 Tbl per quart. And even then, a tablespoon of Diamond Crystal kosher salt doesn’t weigh the same as a tablespoon of Morton kosher salt. Because of this, the weight tables you give for the various brine solutions is a lot more useful, and it’s actually what I came here to find. (Thanks!) I just want more people to be aware that different salts have different densities, so you should always measure by weight -unless- you’re using the exact same salt as the recipe writer used. That’s a great point Jim. Thanks for pointing that out. I’ll make an adjustment to the post to at least point that out to folks. just starting to ferment. Cabbage turned out awesome, both green and the red, but I’m having trouble with the carrots. I use Himalania pink sea salt from the health food store. Is the brine on the carrots suppose to be kind of cloudy? I didn’t peel the carrots and they are not organic. Everyday I have to clean off white scum like stuff. Should I pitch them and start over? Should I peel the carrots? It’s been 4 days and I tried one today and they’re still crunchy but smell different. I honestly haven’t worked too much with carrots in my fermentations. I had a couple of failed attempts early on just trying to ferment carrots (got mushy and just not tasty) and haven’t tried too hard since. I do add carrots to my kimchi often. Sorry I can’t be of much help on this topic. You might try posting on the forum here. Thanks. Carrots have a LOT of sugar. It is very hard to ferment them alone and not grow yeast. Yeast is NOT what you want. Many kinds of yeast are not a problem and are edible but do not give the flavor profile that you are seeking. If you wish to include carrot then add it to your other product (cabbage) in proportions used for KimChee. That should handle the cloudiness issue and reduce the yeast in the ferment (you probably have Kam yeast). The same is true for adding apple or any other sweet fruit or veggie. Be careful of grapes/raisins. grapes have a LOT of sugar, and raisins are usually sulfated. Dates and figs are wonderful but extremely sweet and can cause yeast blooms in any real quantity. Also 2-3% un-iodized salt by weight is the usual amount to use. Weigh your container, then weigh the product and container. Subtract the container weight and multiply by .02. This tells you the weight of salt to add. The container can be veggies only or veggies and water. IF you are adding brine, again add salt at .02-.03 per weight of brine before adding to the product. There are recipes that will go as low as 1.5% salt, however the lower the salt the softer the finished product (less crisp). Too high of salt and fermentation will slow or not happen. Have you ever considered using plain sea water as a brining solution as opposed to making up a solution with salt? Sea water contains about 3.5% salt which you could always dilute with freash water if you want a lower salt concentration. I tried it once, but it was a peculiar local ferment – I was trying to ferment some seed pods of a coastal plant – and the feremnt failed. I haven’t tried it for kimchi yet, but perhaps I’ll try. You’d have to boil the water first here to kill any microorganisms which might be floating around in the sea! The buoyancy brine sounds a bit like the one my grandfather used. It was enough salt to float a fresh egg. That’s fresh, like just out from under the hen, not store bought. The ones in the store are at least two weeks old, because they peel when boiled. (An egg doesn’t peel well until it’s 1.5 to 2 weeks old. The white sticks to the shell.) The older an egg is, the easier it floats (internal gases), so it wouldn’t yield as strong a brine. This got to be long, hopefully it keeps folks that try this out of trouble. I figured out how to get fresh boiled eggs to peel properly. So, how do you get fresh boiled eggs to peel properly?? What are the health benefits to eating fermented foods? 1) There is a probiotic benefit of consuming foods that have pro-biotic content, which help to keep your digestive system populated with beneficial bacteria. 2) By eating fermented foods, we ingest uncooked foods which contain fiber, nutrients and enzymes that have not been destroyed by cooking. 3) Maintaining a healthy digestive system and eating healthy foods is the best path to overall health. I’m slowly working on a more detailed past on this topic. Much research continues to be done in this area since we have discovered that the microorganisms in our guts contribute much more to our overall health and wellbeing than we had preciously knowon or understood. MANY years ago, there was a sea where part of the Himalaya now lies. Sea fossils are also very common there as a result, as well as sea salt. That’s what I saw and what I seem to remember being told when I was there some years ago. has anyone tried fermenting pineapple? i want to make a fermented pineapple habanero sauce but i haven’t found a recipe. Regarding your description above for Kimchi, please clarify 1) how long to soak the cabbage in the brine 2) what you “cover” the cabbage with (fresh water?) after draining the brine. Soaking in brine is 2-4 hours. No need to add anything to cover the kimchi. The natural liquid which remains in the veggies after draining will release when placed under pressure and will raise the liquid level over the veggies. Hope that helps!